This blog post will reassure women that they can be beautiful brides, even if they don’t choose to wear a traditional wedding gown. From tea-length dresses to long, lace gowns, brides have plenty of options when it comes to informal wedding dresses. These days, many brides opt for casual wedding dresses. Some brides opt for an informal dress to match a non-traditional wedding venue such as a beach, a park, or a backyard. Bridal stores in Columbus have plenty of options when it comes to casual gowns, and they compare favorably to more formal dresses. You can even recycle your casual wedding attire for such events as anniversary parties or your average date night. One of the better choices that work for a casual wedding is a tea-length dress. Tea length wedding dresses serve as a moderate compromise between the long, traditional gown and the shorter dresses that more rebellious brides choose. Tea length gowns come with a vintage look and texture that gives it a unique spin on bridal wear. This type of gown works well for both rustic and sophisticated gatherings. You can dress this look up or down with jewelry and dress accents. This dress also works well as summer wear. Informal wedding gowns such as long lace dresses can operate as a sophisticated bridal look that doesn’t take a lot of work to elevate. Backless lace dresses with thin spaghetti straps have a romantic look and feel that is also form-fitting. A see-through shrug and tiered skirt complete this bohemian bridal outfit. Whether you’re getting married in a rustic barn, a sunny beach, or your mother’s backyard, a long lace dress will work well in any informal wedding situation. Your wedding is your day to shine. The day of your wedding will be even more special if you wear a dress that expresses your unique style and personality. 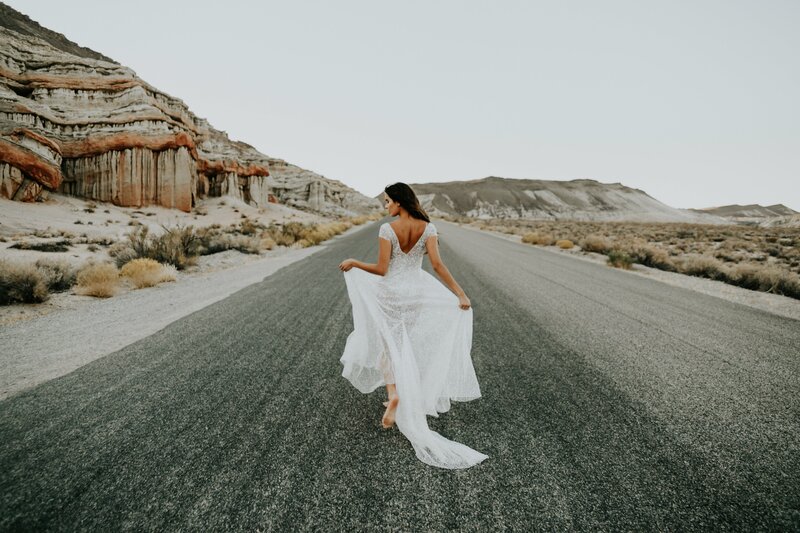 Whether your style is best reflected in a tea length dress, a long bohemian lace gown, or even short wedding dresses such as an ’80s Madonna virgin bride number, you can shine on your wedding day with a dress that tells your personal story.